Professor F. S. Boas does not bring Shakspere of Stratford any nearer to the authorship of the Shakespeare plays than he was before the publication of his book Shakespeare and the Universities (Shakespeare Head Press, 1923). Nor can it honestly be said that the book makes any very important advance in knowledge though the research among the manuscripts and archives at Oxford must have been laborious. He says that Shakespeare knew Oxford much better than Cambridge and that " he was probably thinking of College performances there in the Lord Chamberlain's reminisciences of how he enacted Julius Caesar." (Hamlet, III.-2) But there is no evidence produced to show that the author Shakespeare knew Oxford better than Cambridge. Professor Boas is, as all professional men-of-letters must be, a respectable Stratfordian. 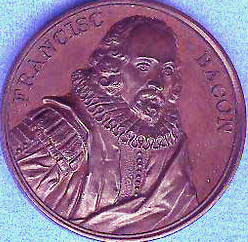 The name of Francis Bacon does not occur once in his book. Why, then, does he make his Shakespeare better acquainted with Oxford than Cambridge? Because to keep the Stratford delusion going it has got to be done. Was not Bacon a Cambridge man? Hath made thee hard in't. "Here the misanthropist talks as if he had graduated on the banks of the Cam. From the earliest days to times comparatively recent a candidate for a degree at Cambridge was required to maintain a syllogistic dispute in the schools, which disputation was called "The Act.' If he was successful and admitted to the full privileges of a graduate, he was said to 'commence' in the Arts of Faculty, and the ceremony at which he was admitted was, and is, called at Cambridge 'the Commencement.' If the candidate went to a higher degree he was said to proceed.
' Tis not in thee........ to scant my sizes. "'Size, as defined by Minsheu, Guide into Tonges (1617), 'is a portion of bread and drink; it is a farthing which schollers in Cambridge have at the buttery. 'To be 'scanted' of 'sizes' was a punishment for undergraduates, an indignity that might well stir Lear to a transport of rage." Nor is this all the evidence of the poet's connection with Cambridge University. In 1595, a book called Polimanteia was published. It's author is given as "W.C." (supposed to be William Covell, a fellow of Queen's College) and in a passage praising the poets and writers of "sweet Cambridge," there is printed in the margin, "All praiseworthy Lucretia, Sweet Shakespeare, Eloquence Gaveston, Wanton Adonis." Knock at his study where, they say, he keeps. Edwin Reed in Francis Bacon our Shakespeare (1902), on pp. 43-45, gives many arguments in support of the contention that Dr. Caius in The Merry Wives of Windsor is an ingenious caricature of Dr. John Caius of Cambridge University who died in 1573 and whose name still lives. How much more interesting Professor Boas could have made his book had he been able to free his mind from the monstrous Stratford delusion. In this way his research is hampered, and knowledge suffers in consequence.